Put a bee on your bonnet! Equal parts warmth and whimsy, this hat will protect your head from the cold while it adds pure, playful fun to your style. 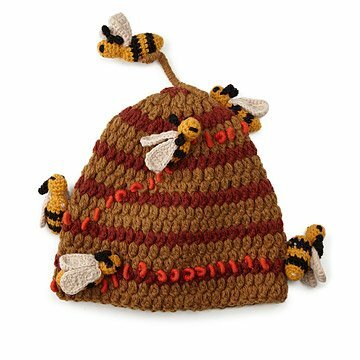 Hand crocheted by a collective of Peruvian artisans, it's crafted from 100% Peruvian highland wool and delightfully detailed with bees buzzing around the "hive" on your head. Made to last, it's the perfect antidote to winters that seem equally permanent. Handmade in Peru. Patricia Dam has an Architectural background but found her niche to create shapes and forms with yarn. The Peruvian knitters that have been working with her for the last 20 years make it all possible with their artful hands, by purchasing Peruvian Trading Company products you don't just buy a product, you buy a better lifestyle for several women from the Andes of Peru. Hand wash cool, gentle, air dry. This hand crocheted wool hat features bees buzzing around a hive.